One male and one female are voted monthly winners by the public and they then become candidates for the Academy’s prestigious Athlete of the Year award. Everyone is encouraged to cast a vote on the Academy’s website at www.ussa.edu and have friends do the same. 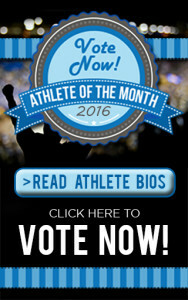 The full ballot is listed along with bios of what each athlete accomplished during the month. Voting will continue until Thursday, 15 December 2016. Male nominees are D’Onta Foreman, football, United States; Ghirmay Ghebreslassie, marathon, Eritrea; Sjinkie Knegt, speed skating, Netherlands; Andy Murray, tennis, Great Britain; Lionel Sanders, Ironman, Canada; and Ben Zobrist, baseball, United States. Female nominees are Charley Hull, golf, Great Britain; Mary Keitany, marathon, Kenya, Meredith Kessler, Ironman, United States; Katie Ledecky, swimming, United States; Annika Schleu, modern pentathlon, Germany; and Mikaela Shiffrin, alpine skiing, United States. This is the 32nd year of the Academy’s Athlete of the Year program, part of the institution’s annual Awards of Sport program. Each month, the public is invited to participate by nominating and voting for the male and female Athletes of the Month on the Academy’s website. Monthly winners become eligible for the prestigious Athlete of the Year honor, which is selected at year end by online public balloting. Monthly and annual winners are announced on the Academy’s website, social media, and in the monthly e-newsletter, The Sport Update.